The inventory is the player's personal repository which contains all the Battle trophies, Boosters, Wagers, Discounts and Tickets (items) purchased by the player or received in daily rewards. You can access the item store via the inventory menu. In the item store, you can purchase several types of items. The item store has the same tab structure, apart from discounts and wagers, which can only be received from battle trophies. Purchases made in the store are placed in the inventory or opened immediately in the case of battle trophies. The inventory can be accessed via the button with the image of a box in the right side of the top menu (next to the “store” button), and also via “Menu” – “Inventory”. The top menu allows you to switch between your personal inventory and the item store, and also provides a means to sort items by category, which can be useful for organizing an inventory containing many different items. On the left side of the inventory, there is a list of the items the player has (inventory) or the items available for purchase (store). Only items are displayed which match the category currently selected. The right side of the window contains a detailed description of the item selected in the inventory. You can also access an item's detailed description by hovering over it with your cursor. Each item's cell displays only general information about it. The item's full description is shown on the right side of the window after you click on the item's cell. The description is also displayed when you hover the cursor over the item's cell. Discounts – an icon showing the size of the discount in percentages is displayed directly in the slot of the vehicle (“Research” menu) to which the discount applies. The vehicle's price is displayed with the discount taken into account. You can activate items by hovering over them and clicking Activate or by selecting the item and pressing the same button at the bottom of the inventory. After activation, the background of the Booster, Discount or Wager will be highlighted gold, and the timer will show the time in which the effect given by the item must be used. A Battle trophy is opened immediately and the player receives its random contents. The top left corner displays a timer showing the item's expiry time or usage period – the time in which the item must be activated or its effect used. The top right corner shows the number of identical items in the inventory of the same type and form. The bottom left corner of the item icon indicates the type the item belongs to. In the case of these examples, this is a Booster which increases Silver Lions income (the second increases research point income). The other Booster shows that it provides a 10% bonus to research points for the entire team (the arrows instead of the background plaque show this). It has no expiry time because it was purchased in the item store rather than received as a daily reward for logging into the game. Items can be obtained from various sources. Many of them can received as a gift during specials or randomly obtained as a daily login reward or even immediately as a trophy after the battle. Some of them are also available through the in-game store. Some items are not activated manually, and have an effect and expiration time starting from the moment the player obtained them. For example, items gained through daily login rewards will usually have an expiration time, while items purchased from the in-game store will not. Battle trophies are sets which can contain items of all types and forms, including highly effective items unavailable in the store. Apart from ordinary items, battle trophies can also contain Golden Eagles, Premium Account time, Rare Premium and Gift Vehicles, Silver Lions bonuses, Boosters, Wagers, Discounts, Decals, Titles and much more! When you purchase a battle trophy, the trophy's contents are decided at random and you immediately receive them. You always receive one or several of the content options indicated on the battle trophy. There are no empty battle trophies. These are not to be confused with Combat trophies which are a random free gift after the end of each battle. Reward Items, Battle Trophies, Wagers, Tickers and more awaits you! Soldier's Trophy – small chance of receiving a premium vehicle. Commander's Trophy – good chance of receiving a premium vehicle. Officer's Trophy – high chance of receiving a premium vehicle. Promo Trophy – this trophy could contain absolutely anything. Trophies like these are usually received from offers or contests. Special Battle Trophy – every War Thunder player receives this trophy for logging into the game every day. Regularly visiting the game increases the value of the trophy's contents, from unique highly effective boosters to wagers with Golden Eagles as a reward. 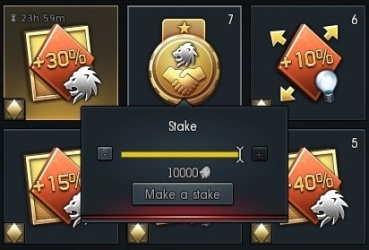 Boosters are items which increase your income in research points or Silver Lions. Boosters can be either personal or team-based, and they can affect either the overall income of an entire battle, or provide a bonus for specific achievements or actions in battle. Boosters can be activated at any time and have various different requirements before they expire. Personal boosters are identifiable by their square base and provide a bonus only to their owners. Team boosters are identifiable by their three arrows and provide a bonus to all allies in battle. The effect boosters provide varies from +10% to +500%. Boosters vary in their duration or number of battles fought / successful battles fought and the fulfillment of other conditions. Specific details on each booster can be found in its description, and the effect of some boosters is calculated automatically – you can see this by hovering your cursor over the balance panel. Active silver lion booster.Bonuses are displayed when hovering over the "Silver lions" menu box. Active research points booster.Bonuses are displayed when hovering over the "Silver lions" menu box. 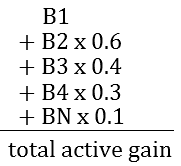 Where: B1, B2, B3… are active boosters in order of their reduced effect (the formula favors the player). All subsequent boosters after the forth one are calculated as B*0.1 without additional diminishing returns. Are arranged in the formula in order of their reduced effect regardless of what order they were activated in: 150% + 150%*0.6 + 40%*0.4 = 256% bonus to Silver Lions. Wagers are items that will allow you to create a "bet" with the game to perform a special mission in random battles in order to receive the highest award. Wagers are divided into stages, and so each wager lasts for several battles. Completing each stage brings the player closer to receiving a more valuable reward. A victory point in a wager is given for a battle in which the player has fulfilled the necessary conditions for its completion. If the condition of the wager is not satisfied in the battle, then the player will receive one defeat. The bet is considered complete if the player has received the maximum number of defeats or victories. Example of the Vehicle Destruction wager description and the betting interface. To use a wager, you must place a bet in Silver Lions. The higher the bet, the greater the reward will be for completing the wager. 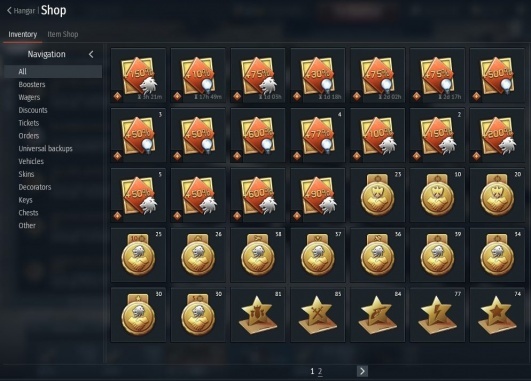 Here a short introduction on how to activate them from the Gaijin support page. You are given several attempts to complete a wager. After you use all the attempts or complete the wager successfully, it disappears and the player receives a reward corresponding to the stage at which the wager ended. Band together in a squad! A coordinated team is more effective and has a higher chance of victory, and your comrades will help you destroy the required number of enemies and cover you while you complete your wager's requirements. In addition, some Wagers cannot be completed at all without a squad, for example: wagers with the “Best squad” achievement. Let's use the Vehicle Destruction wager as an example. We see the Wager's fulfillment conditions in its description: we must destroy 5 enemy tanks or airplanes in a single battle on each stage. We can only use III-IV rank vehicles to complete this Wager, and the missions must be completed in random battles. All the requirements are available for reading before the Wager is activated. Note that a wager's mission can be completed only if all its requirements are met. Use vehicle presets to save a preferred group of vehicles in the hangar to conveniently complete a wager. When you activate a wager, the bet is placed only once, and its size defines the subsequent reward for completing each stage. You cannot change the bet after activating the wager. We activate the wager and place the maximum bet – judging by the wager's conditions, completing the first stage will pay back the bet, and the two following stages will bring us significant profit. After activating the wager, its progress will be shown in the vehicle menu. We enter a random battle and complete the wager's requirements by destroying 5 enemies. After each successful battle, the top right corner of the results window will display the wager's icon, its completion status and the reward received. Good luck in completing your wagers! Discounts are items that reduce the cost certain goods for the player. This can include discounts on Premium account time, Premium Aircraft and Tanks, Research Points conversion, Golden Eagles as well as several others. These can be particular useful for when you have been saving up for a specific vehicle or maybe want to convert some extra Research points for a specific nation. Tournament tickets give access to a tournament. When expired, the ticket is automatically replaced by another, if there is one available. This will not reset statistics, progress and awards gained by the player during the tournament. Within this mode, a skilled pilot or tanker can earn prizes immediately after their victories without any need to wait for the tournament to be over. In these events, players will be matched based on their personal rating so it won't be based on the vehicles battle rating. This page was last edited on 4 February 2019, at 17:46.